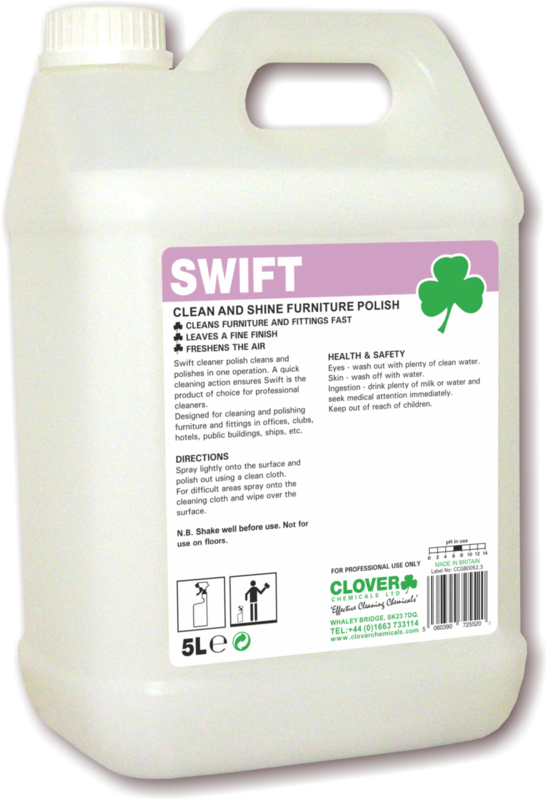 Clover Swift is a ready to use clean and shine furniture polish, which cleans and polishes in one application. 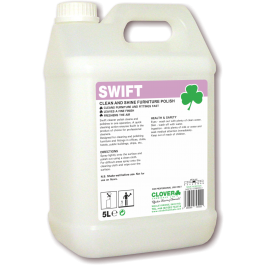 Swift is an emulsion of cleaning agents and silicones in an aqueous base, and leaves a fine finish and freshens the environment with a sophisticated fragrance. Designed for cleaning and polishing modern furniture and fittings, including glass surfaces. Ideal for use in hotels, offices, nursing homes and public buildings, the product of choice for professional cleaners. Cleans and polishes in one application. Spray Swift lightly onto the surface and polish using a clean cloth. For difficult areas spray onto a cloth and wipe over the surface. N.B. Shake well before use. Not for use on floors.